Review – Who’s Afraid of Beowulf? Recently, in class, we have been learning about “Voice” and how different genres need to be written in a voice typical of that genre. I have had difficulty with this – I just write, without thinking about how I do it. 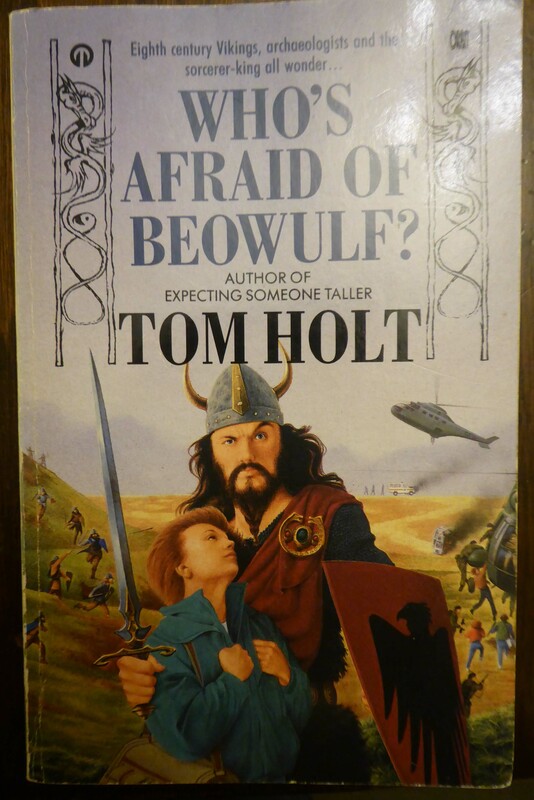 One of the genres we discussed was humour and Tom Holt’s book “Who’s Afraid of Beowulf?”. Someone lent me a copy. I loved it! If you are the sort of reader that enjoys the idea of Vikings rampaging across Northern Scotland (or indeed, London) dressed in grey suits from Marks and Spencer – complete with swords and helmets, this is the book for you. The story is simple. An ancient barrow is discovered, filled with a crew of sleeping Vikings. Clumsy archaeologist Hildy Frederiksen disturbs them, just in time to save the world from an evil Sorcerer-King. A standard fantasy plot (I assume – I don’t read much fantasy.) that is high-jacked by the upending of expectations. For example the Vikings, who talk and act as you would expect, are completely unfazed by the modern world. As people used to facing sorcerers and dragons, what is there to be feared in a double-decker bus? It’s just magic. They find there are places in Scotland that they say haven’t changed in 1200 years – alcohol can still be drunk on the same premises. The Sorcerer-King is a rich businessman in a London tower block. He invented computers and controls newspapers. Extra enjoyment, for me, came from the fact that this book was published in 1988, when computer languages were FORTRAN and BASIC and radiophones in cars were a rich man’s toy. There are wizards and elemental spirits that get drunk on electricity. There is a wolf who was transformed into a man so long ago, that when he returns to wolf shape, he cannot remember how to attack. And there is a BBC film maker obsessed with a conspiracy involving the Milk Marketing Board. It is not just the evil characters (see last post) that provide the fun, it is also the Vikings. They all have their own characters, their own jokes; their disappointments when they discover the saga telling of their famous deeds has not survived the years, or has been twisted out of shape – like the Sutton Hoo helmet which they explain to the British Museum guide has been wrongly recreated. They would have got nowhere, though, without Hildy. She joins the Vikings, driving them about in a variety of vehicles, selling Viking rings to dealers for cash, buying multiple servings of fish & chips to feed the King and his warriors and of course the M&S suit to disguise them. She does so well that the king give her a Name – Vel-Hilda. “The Nose word vel is short and means “well”. The same may be said of you.” A piece of wordplay worthy of the Vikings (or Anglo-Saxons). Did I learn anything from this book? Something about building memorable characters and the use of the right word to define time and place. Also I will read more books by Tom Holt – why hadn’t come across him before? I like to use a little humour in my writing, but I’m not sure I could manage something so accomplished – though it would be fun trying. Writing update: 9,356 words in a week. Although not necessarily in the week in question. I was stopped in my tracks by the trip to the National Archives in London and distracted by a (possible) ancestor who left an estate worth one thousand pounds and upwards – in 1666! 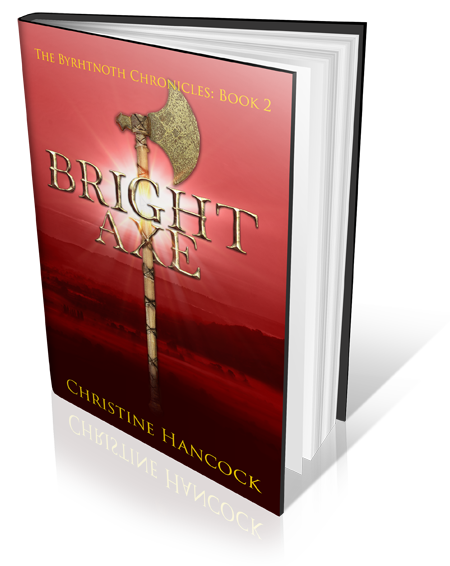 Must go now – my publisher has sent the final proofs for the complete cover of Bright Sword and I must go and drool over it.